This post shows some great footage that we’ve obtained for Smallmouth Bass at different stages of spawning in Lake Ontario. Based on our research over the past 3 years, we’ve also included some information about the timing of the different developmental stages because this is a topic that we are often asked about. If you’re interested in learning more about the reasons why this issue might be important, we’ve provided some additional information below. Most people that fish for Smallmouth Bass on Lake Ontario know that there are still fish at various stages of spawning when the recreational angling season begins. This is largely due to the fact that Lake Ontario takes a long time to heat up in the spring compared to smaller lakes. Many anglers have asked us if this is important since we do a lot of research on bass out there. This is a controversial topic that will draw lots of different responses, even amongst fisheries biologists. In our opinion, an essential first step towards understanding the importance of this issue is to obtain more scientific information about the timing of the spawning period for Smallmouth Bass in Lake Ontario. 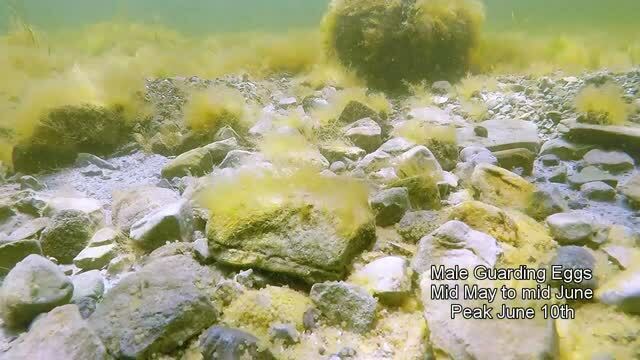 The video associated with this post confirms that there are many Smallmouth Bass that are still guarding fry when the season starts (June 21, 20 and 18 in 2014, 2015 and 2016 respectively). It is noteworthy that our data also provides a conservative estimate for a few different reasons. For example, fish spawning around islands in the main lake where the water is cooler are probably even slower than those in the bays we’ve monitored. We expect that there will be lots of discussion around this issue in the future and will continue to collect and post information on this topic. For the time being, however, we are hoping that tournament organizers will consider this issue when making decisions about the dates for events on Lake Ontario that would target Smallmouth Bass.